Niterói Bus Lines: 33 (jump off in front of the entrance of the Barão do Rio Branco fort. The climb to the Pico and São Luiz Forts can be done on foot, or in the visitor’s private vehicle). 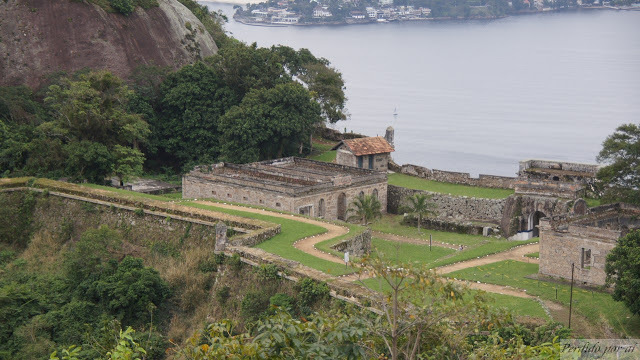 São Luiz Fort dates from 1567 and it was effectively built between 1769 and 1770, during the government of Luiz de Almeida – 2nd Marquis of Lavradio. The fortification was completed in 1775. However, a few years later, his command was discontinued, and his garrison was merged into the Santa Cruz Fortress. The Fort remained abandoned between 1831 and 1863, until its reactivation due to “Christie’s Diplomatic Issue”. It has a wonderful view to the entire Guanabara Bay and the seaside of Niterói and comprises several types of cannons of various calibers used in World War II and brought to Brazil as war trophies. In order to get to São Luiz Fort, you will need to walk through a path full of wild animals and surrounded by virgin forest, for it is an army-restricted area, which prevented the man from changing its vegetation. In addition to the fact that the tour is very historically and culturally rich, the beauty of the place is unique and impressive. Today is one of the few places in the city with remnants of native Atlantic Rainforest. At the top of the Pico Fort, the visitor will find one of the best panoramic views in the world, by rotating 360° and realizing there is no object obstructing such a view: the spectacular landscape of Santa Cruz Fortress, the city of Rio de Janeiro, the entrance to Guanabara Bay, Corcovado and Sugar Loaf.